45 million tons of apples were grown worldwide in 2002, with a value of about 10 billion USD. China produced almost half of this total. Argentina is the second leading producer, with more than 15% of the world production. The United States is the third leading producer, accounting for 7.5% of world production. Turkey is also a leading producer. France, Italy, South Africa and Chile are among the leading apple exporters. In the United States, more than 60% of all the apples sold commercially are grown in Washington state. Imported apples from New Zealand and other more temperate areas are competing with US production and increasing each year. Apples can be canned, juiced, and optionally fermented to produce apple juice, cider, vinegar, and pectin. Distilled apple cider produces the spirits applejack and Calvados. Apple wine can also be made. They make a popular lunchbox fruit as well. Apples are eaten with honey at the Jewish New Year of Rosh Hashanah to symbolise a sweet new year. The apple is a tree and its pomaceous fruit, of the species Malus domestica in the rose family Rosaceae. It is one of the most widely cultivated tree fruits. It is a small deciduous tree reaching 5-12 m tall, with a broad, often densely twiggy crown. The leaves are alternately arranged, simple oval with an acute tip and serrated margin, slightly downy below, 5-12 cm long and 3-6 cm broad on a 2-5 cm petiole. The flowers are produced in spring with the leaves, white, usually tinged pink at first, 2.5-3.5 cm diameter, with five petals. The fruit matures in autumn, and is typically 5-9 cm diameter (rarely up to 15 cm). The centre of the fruit contains five carpels arranged star-like, each carpel containing one or two (rarely three) seeds. The wild ancestor of Malus domestica is Malus sieversii. It has no common name in English, but is known in Kazakhstan, where it is native, as 'alma'; in fact, the region where it is thought to originate is called Alma-Ata, or 'father of the apples'. This tree is still found wild in the mountains of Central Asia in southern Kazakhstan, Kyrgyzstan, Tajikistan, and Xinjiang, China. For many years, there was a debate about whether M. domestica evolved from chance hybridisation among various wild species. Recent DNA analysis by Barrie Juniper, Emeritus Fellow in the Department of Plant Sciences at Oxford University and others, has indicated, however, that the hybridisation theory is probably false. Instead, it appears that a single species still growing in the Ili Valley on the northern slopes of the Tien Shan mountains at the border of northwest China and the former Soviet Republic of Kazakhstan is the progenitor of the apples we eat today. Leaves taken from trees in this area were analyzed for DNA composition, which showed them all to belong to the species M. sieversii, with some genetic sequences common to M. domestica. Some individual M. sieversii, recently planted by the US government at a research facility, resist many diseases and pests that affect domestic apples, and are the subject of continuing research to develop new disease-resistant apples. The apple tree was perhaps the earliest tree to be cultivated, and apples have remained an important food in all cooler climates. To a greater degree than other tree fruit, except possibly citrus, apples store for months while still retaining much of their nutritive value. Winter apples, picked in late autumn and stored just above freezing, have been an important food in Asia and Europe for millennia, as well as in Argentina and in the United States since the arrival of Europeans. The word 'apple' comes from the Old English word æppel, which in turn has recognisable cognates in a number of the northern branches of the Indo-European language family. The prevailing theory is that 'apple' may be one of the most ancient Indo-European words (*abl-) to come down to English in a recognisable form. The scientific name malus, on the other hand, comes from the Latin word for apple, and ultimately from the archaic Greek mālon (mēlon in later dialects). The legendary placename Avalon is thought to come from a Celtic evolution of the same root as the English 'apple'; the name of the town of Avellino, near Naples in Italy is likewise thought to come from the same root via the Italic languages. Linnaeus assigned the apple to the genus Pyrus, along with pears and quinces. Philip Miller subsequently separated the apple into its own genus, a division repeatedly ratified over the years. There are more than 7,500 known cultivars of apples. Different cultivars are available for temperate and subtropical climates. Reputedly the world's biggest collection of apple cultivars is housed at the National Fruit Collection in England. Apples do not flower in tropical climates because they have a chilling requirement. Commercially popular apple cultivars are soft but crisp. Other desired qualities in modern commercial apple breeding are a colourful skin, absence of russeting, ease of shipping, lengthy storage ability, high yields, disease resistance, typical 'Red Delicious' apple shape, long stem (to allow pesticides to penetrate the top of the fruit), and popular flavour. Old cultivars are often oddly shaped, russeted, and have a variety of textures and colours. Many of them have excellent flavour (often better than most modern cultivars), but may have other problems which make them commercially unviable, such as low yield, liability to disease, or poor tolerance for storage or transport. A few old cultivars are still produced on a large scale, but many have been kept alive by home gardeners and farmers that sell directly to local markets. Many unusual and locally important cultivars with their own unique taste and appearance are out there to discover; apple conservation campaigns have sprung up around the world to preserve such local cultivars from extinction. In the United Kingdom old cultivars such as Cox's Orange Pippin and Egremont Russett are still commercially important even though by modern standards they are low yielding and disease prone. Although most cultivars are bred for eating fresh (dessert apples), some are cultivated specifically for cooking (cooking apples) or producing cider. Cider apples are typically too tart and astringent to eat fresh, but they give the beverage a rich flavour that dessert apples cannot. Modern apples are, as a rule, sweeter than older cultivars. Most North Americans and Europeans favour sweet, subacid apples, but tart apples have a strong minority following. Extremely sweet apples with barely any acid flavour are popular in Asia and especially India. Tastes in apples vary from one person to another and change continually over time. As an example, the U.S. state of Washington made its reputation for apple growing on Red Delicious. In recent years, many apple connoisseurs have come to regard the Red Delicious as inferior to cultivars such as Fuji and Gala due to its merely mild flavour and insufficiently firm texture. Like most perennial fruits, apples are ordinarily propagated asexually by grafting. Seedling apples are different from their parents, sometimes radically. Most new apple cultivars originate as seedlings, which either arise by chance or are bred by deliberately crossing cultivars with promising characteristics. The words 'seedling', 'pippin', and 'kernel' in the name of an apple cultivar suggest that it originated as a seedling. Apples can also form bud sports (mutations on a single branch). Some bud sports turn out to be improved strains of the parent cultivar. Some differ sufficiently from the parent tree to be considered new cultivars. Some breeders have crossed ordinary apples with crabapples or unusually hardy apples in order to produce hardier cultivars. For example, the Excelsior Experiment Station of the University of Minnesota has, since the 1930s, introduced a steady progression of important hardy apples that are widely grown, both commercially and by backyard orchardists, throughout Minnesota and Wisconsin. Its most important introductions have included 'Haralson' (which is the most widely cultivated apple in Minnesota), 'Wealthy', 'Honeygold', and 'Honeycrisp'. Apples appear in many religious traditions, often as a mystical and forbidden fruit. Though the forbidden fruit in the book of Genesis is not identified, popular European Christian tradition has held that it was an apple that Eve coaxed Adam to share with her. As a result, in the story of Adam and Eve the apple became a symbol for temptation, the fall of man into sin, and sin itself. In Latin, the words for "apple" and for "evil" are similar ("malus" - apple, "malum" - evil). This may be the reason that the apple was interpreted as the biblical "forbidden fruit". The larynx in the human throat has been called Adam's apple because of a notion that it was caused by the forbidden fruit sticking in the throat of Adam. 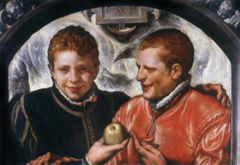 In this painting modern interpreters have viewed the apple alternately as an ironic twist on Christian symbology intended by the painter as a sexual innuendo between two men , or as a memento mori . Crispin van den Broeck (Dutch), ca. 1590; Oil on panel; Fitzwilliam Museum, Cambridge.This notion of the apple as a symbol of sin is reflected in artistic renderings of the fall from Eden. When held in Adam's hand, the apple symbolises sin. However, when Christ is portrayed holding an apple, he represents the Second Adam who brings life. This also reflects the evolution of the symbol in Christianity. In the Old Testament the apple was significant of the fall of man; in the New Testament it is an emblem of the redemption from that fall, and as such is also represented in pictures of the Madonna and Infant Jesus. There are several instances in the Old Testament where the apple is used in a more favourable light. The phrase "the apple of your eye" comes from verses in Deuteronomy 32:10, Psalm 17:8 Proverbs 7:2, and Zechariah 2:8 implying an object or person greatly valued. In Proverbs 25:11, the verse states, "a word fitly spoken is like apples of gold in settings of silver". In the love songs of the Song of Solomon, the apple is used in a sensual context. In these latter instances the apple is used as a symbol for beauty. The apple appears again in Joel 1:12 in a verse with a sense of profound loss when the apple tree withers. At times artists would co-opt the apple, as well as other religious symbology, whether for ironic effect or as a stock element of symbolic vocabulary. Thus, secular art as well made use of the apple as symbol of love and sexuality. It is often an attribute associated with Venus who is shown holding it. Apple orchards are established by planting trees two to four year old. These small trees are usually purchased from a nursery where they are produced by grafting or budding. First, a rootstock is produced either as a seedling or cloned using tissue culture or layering. This is allowed to grow for a year. Then, a small section of branch called a scion is obtained from a mature apple tree of the desired cultivar. The upper stem and branches of the rootstock are cut away and replaced with the scion. In time, the two sections grow together and produce a healthy tree. Rootstocks affect the ultimate size of the tree. While many rootstocks are available to commercial growers, those sold to homeowners who want just a few trees are usually one of two cultivars; a standard seedling rootstock that gives a full-size tree, or a semi-dwarf rootstock that produces a somewhat smaller tree. Dwarf rootstocks are generally more susceptible to damage from wind and cold. Full dwarf trees are often supported of posts or trellises and planted in high density orchards which are much simpler to culture and greatly increase productivity per unit of land. There has been limited research into growing apples on their own roots (i.e. without a rootstock)in England this was initiated by Hugh Ermen at Brogdale, Kent and has been carried on by Phil Corbett in Nottinghamshire. Some of the supposed benefits are greater disease resistance and better flavour. Some trees are produced with a dwarfing 'interstem' between a standard rootstock and the tree, resulting in two grafts. After the small tree is planted in the orchard, it must grow for 3-5 years (semi-dwarf) or 4-10 years (standard trees) before it will bear sizeable amounts of fruit. Good training of limbs and careful nipping of buds growing in the wrong places, are extremely important during this time, to build a good scaffold that will later support a fruit load. Growers with old orchard blocks of single cultivars sometimes provide bouquets of crab apple blossoms in drums or pails in the orchard for pollenizers. Home growers with a single tree, and no other cultivars in the neighbourhood can do the same on a smaller scale. Symptoms of inadequate pollination are excessive fruit drop (when marble sized), small and misshapen apples, slowness to ripen, and low seed count. Well pollinated apples are the best quality, and will have 7 to 10 seeds. Apples having fewer than 3 seeds will usually not mature and will drop from the trees in the early summer. Inadequate pollination can result from either a lack of pollinators or pollenizers, or from poor pollinating weather at flowering time. It generally requires multiple bee visits to deliver sufficient grains of pollen to accomplish complete pollination. Growing apples near a body of water can give an advantage by slowing spring warm up, which retards flowering until frost is less likely. In some areas of the USA, such as the eastern shore of Lake Michigan, the southern shore of Lake Ontario, and around some smaller lakes, this cooling effect of water, combined with good, well-drained soils, has made apple growing concentrations possible. However, the cool, humid spring weather in such locations can also increase problems with fungal diseases, notably apple scab; many of the most important apple-growing regions (e.g. northern China, central Turkey, and eastern Washington in the USA) have climates more like the species' native region well away from the sea or any lakes, with cold winters leading to a short, but warm spring with low risk of frost. Home growers may not have a body of water to help, but can utilise north slopes or other geographical features to retard spring flowering. Apples (or any fruit) planted on a south facing slope in the northern hemisphere (or north facing in the southern hemisphere), will flower early and be particularly vulnerable to spring frost. Apples are relatively indifferent to soil conditions and will grow in a wide range of pH values and fertility levels. They do require some protection from the wind and should not be planted in low areas that are prone to late spring frosts. Apples do require good drainage, and heavy soils or flat land should be tilled to make certain that the root systems are never in saturated soil.